福音的核心是认识耶稣。耶稣到底是谁？对有的人，这可能是个陌生的问题。对有的人，这可能是个熟悉的问题。而对有的人，这可能是既熟悉又陌生的问题。～The core message of the gospel is to know Jesus. Who is Jesus then? To some people, this might be an unfamiliar question. To someone else, this might be a familiar question. Still to some others, this could be a question both familiar and unfamiliar. I. 祂说祂是谁？ Who Did He Say He is? II. 人说祂是谁？ Who Did They Say He is? III. 你说祂是谁？ Who Do You Believe He is? 1. 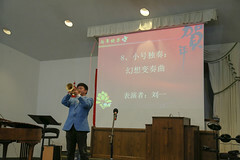 基督徒是“小基督”的意思，指真认识耶稣、跟随耶稣的人。～ Christian means “Little Christ”, i.e. those who truly know Jesus and follow Jesus. 3. 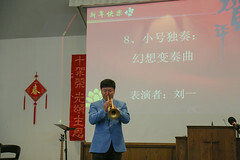 默想并背诵约翰福音 1:1:太初有道，道与神同在，道就是神～ Meditate on and Memorize John 1:1 : In the beginning was the Word, and the Word was with God, and the Word was God.